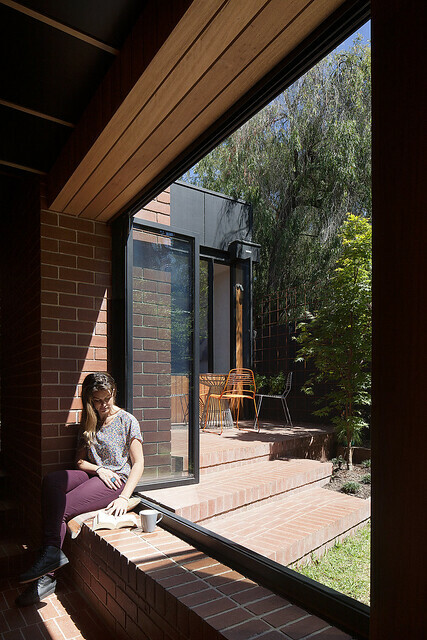 For well over a century, this modest cottage in North Carlton has been on a renovation journey. 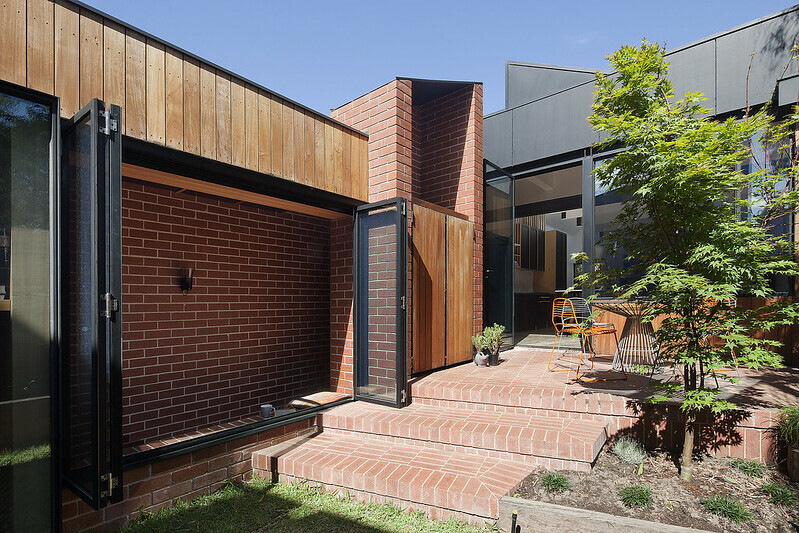 It began life as a “workers cottage” with two bedrooms and the modern convenience of a rear laneway for coal delivery and nightsoil removal, and possibly stabling. Despite the narrow frontage, this is a detached house, a step up from the humble terraces in nearby Carlton. 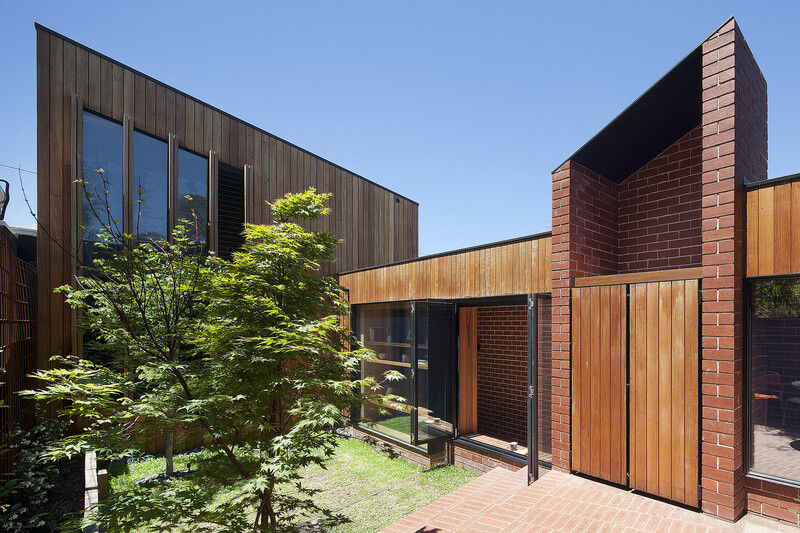 It was built in rendered and painted brickwork, the bricks probably being pressed in an adjacent suburb and fired using the latest technology, the Hoffman continuous kiln. 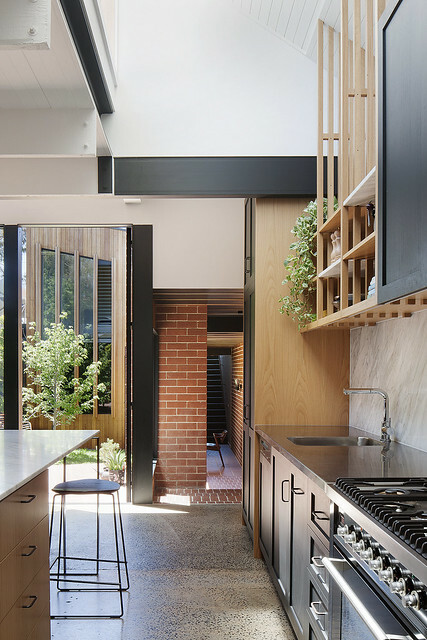 Soon after moving in about eight years ago the current owners added to its iterations by rebuilding the rear to incorporate a modern kitchen, living and dining area. While removing some render at the entry they uncovered a patch of the original red bricks. “It looked pretty rough but they loved it and left it exposed,” says Antony Martin, principal of MRTN Architects. This was the seed of the idea for the materiality of this latest extension project. With the impending birth of their second child, the owners approached Martin seeking a third bedroom and an ensuite bathroom. A heritage overlay requires the street elevation to be original and also specifies that any garaging off the rear lane be retained. Conventional wisdom has it that therefore the only way to extend and retain a back garden is to go up and over the back of the house and this was their initial requirement. Martin was less convinced, arguing that because of height limitations and screening for overlooking, the footprint of an upstairs bedroom would be small, and the downstairs would be compromised by a staircase. 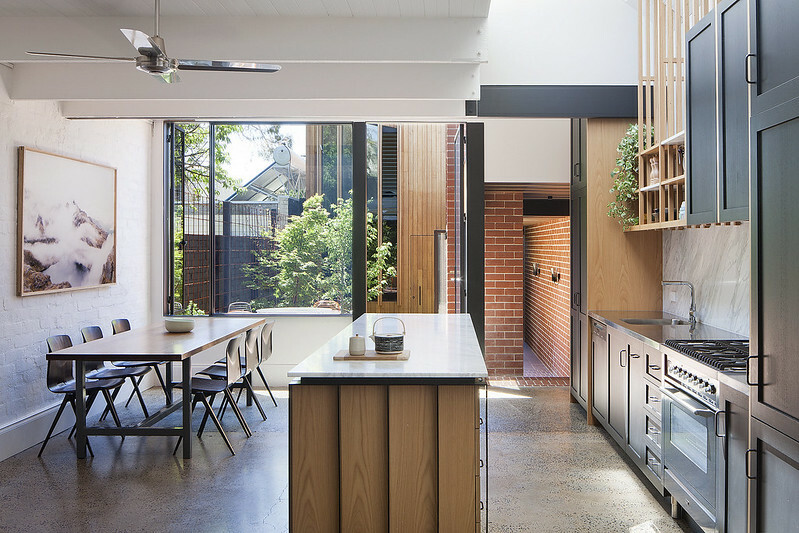 “Pancaking the space also limits or removes the ability to use skylights,” he adds. He saw the potential to build a main bedroom suite over the rear garage, linked to the house by a corridor that follows the southern boundary. Hence the project’s name: Carlton Cloister. 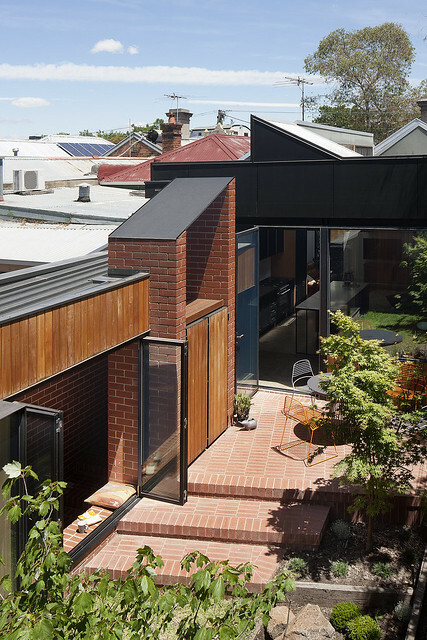 This novel approach leaves a substantial courtyard – by inner city standards –with solar penetration and northerly views. To avoid impacting the amenity of the southern neighbour, the corridor is sunken up to one metre below grade. The finished height is up to 300mm above the permissible fence height, which required planning approval. The rear face was bagged and painted to the neighbour’s requirement. 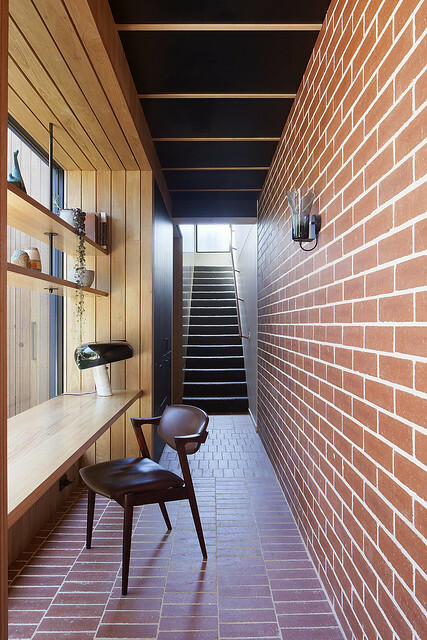 The brick chosen for the new work is Austral Bricks Nubrik Series Chapel Red, a pressed unit that continues a building material tradition that began in Melbourne’s post-Gold Rush era. These are bricks famed for their integrity, crisp edges, depth of colour and individual character. He adds that the brick paving also has superior slip resistance and allowed the creation of patterning and definition in the flooring. 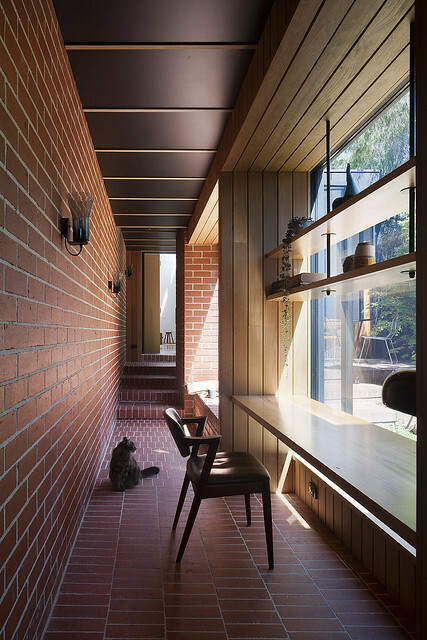 The corridor is largely paved in a staggered stretcher bond following its length, whereas its approaches and the window seat area have bricks laid at 90 degrees to this. The walling is in conventional stretcher bond. The brick-on- edge paving continues in the courtyard with a threshold and steps leading down to the landscaping. Note that the step edges are defined by being laid as a soldier course, and that the leading edge overlaps the underlying course by about 20 millimetres. This is repeated in the steps leading down to the corridor. Consideration was given to finishing the paving with a penetrating sealer but this was decided against and has proved to be unnecessary. 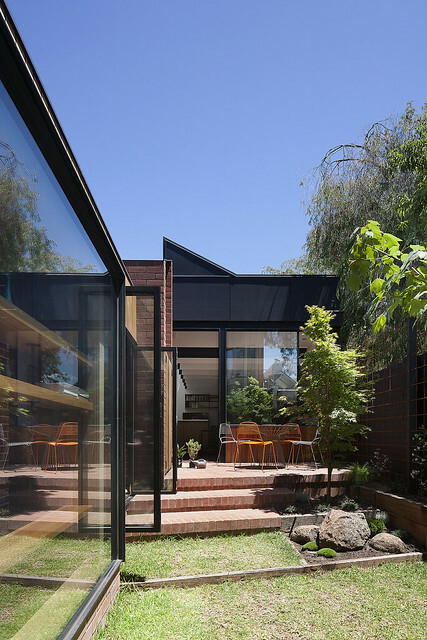 This extension/addition is the latest in a series of rolling renovations that have marked the five generations of this house’s existence. The family that first occupied this in the 1890s would still recognise the program of rooms and quickly appreciate the changes that have been made. The renovation journey will continue and eventually this home will be repurposed for another generation. For example, if the car no longer dominates our culture and the garaging requirement is removed, a completely self-continued unit could be accessed from the rear lane. “The bricks that built Melbourne” are set to be part of these changes across the generations. Nubrik Series. In a homogeneous world, it’s refreshing to find a truly authentic product.